Director – Steven Quale, Screenplay – Eric Heisserer, Producers – Craig Perry & Warren Zide, Photography (3D) – Brian Pearson, Music – Brian Tyler, Visual Effects Supervisor – Ariel Velasco Shaw, Visual Effects – Cora Visual Effects, Prime Focus (Supervisor – Chad Wiebe) & Soho VFX, Special Effects Supervisor – Rory Cutler, Makeup Effects – Lindala Schminken FX Ltd, Production Design – David Sandefur. Production Company – New Line Cinema/Zide Pictures/Practical Pictures. A group of people from Presage Paper head off on a weekend team-building exercise. Just as their bus crosses a bridge, Sam Lawton has a premonition of a combination of roadworks and high-winds causing the middle of the bridge to collapse and all of them to be killed. As he sees details from his premonition starting to happen, Sam warns the others and eight of them are able to escape before the bridge collapses. Afterwards, they are warned by a mysterious coroner that Death does not like to be cheated. In short course, each of them starts to be killed by a series of freak accidents. This is the fifth entry in the series that began with Final Destination (2000). Final Destination was a teen supernatural thriller based on a gimmicky premise – teenager has a premonition of an airline disaster, prevents it, only to find that because he and his friends have upset the natural order of Death by surviving that they are now earmarked for a series of bizarre novelty deaths. The series was spun out in Final Destination 2 (2003), Final Destination 3 (2006) and The Final Destination (2009) each with different types of disaster and different teen casts undergoing a series of improbably contrived novelty deaths. Both The Final Destination and Final Destination 5 were shot in 3D, the ubiquitous new gimmick process du jour. (There is a particularly cool opening credits sequence here that involves glass repeatedly shattering in slow-motion and coming out of the screen at us). The Final Destination came out just before the 3D movement was gathering steam. Here the producers have employed as director Steven Quale, a James Cameron associate all the way back to the 1980s. Quale was second unit director on Titanic (1997) and crucially was visual effects supervisor on Avatar (2009), the film that inspired the current 3D fad, as well as co-director with Cameron of the 3D documentary Aliens of the Deep (2005) exploring deep sea marine life. Quale’s only prior solo directorial film was the disaster movie Superfire (2002). A Final Destination film that offered some explanations for once would be a novelty – although this effort does attempt to add some new rules to the mix such as one being able to cheat being claimed by taking someone else’s life (more, one suspects, to mix up the very limited nature of the storytelling, which in all the other films simply involves the teenagers being progressively eliminated). This film even contrives to add a villain of sorts amid the line-up of victims. The good news about Final Destination 5 is that it takes the absurdities and limitations of the series as a given and embraces them to emerge as the most fun entry to date. I entered into the film with zero expectations based on the unexceptional nature of the other Final Destination films and ended up enjoying the film. It is not a work of art but in terms of what it sets out to be and what is achieves, it a far more engaging time waster than it has any right to be. 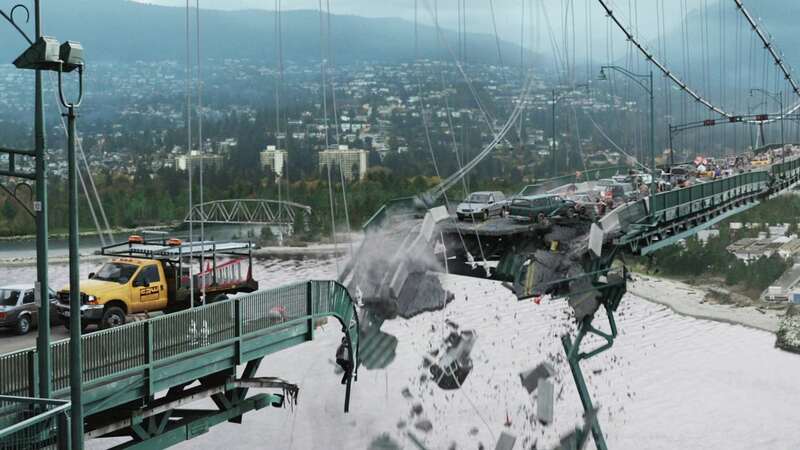 The premonition sequence that kicks the film off is the most elaborate sequence that we have seen in any of the Final Destination films (and incidentally demolishes the Lions Gate Bridge, one of the principal landmarks here in Vancouver, which proved of some amusement at the local press screening). We get an amazing array of death scenes during this sequence with David Kochner being incinerated by hot tar; Miles Fisher impaled by metal spikes; Nicholas D’Agosto being sliced in two by a sheet of metal; a body falling all the way down to splatter on the concrete palings below; and especially where we see Ellen Wroe falling off the bridge to be impaled on the mast of a yacht beneath where it and her entrails come out of the 3D screen into the audience. The sequence is the show’s highlight. The various killings throughout are staged with an enormous degree of fun. Ellen Wroe has a bizarre sequence where a fall off a horizontal bar in a gym ends up turning her into a human pretzel of broken bones; P.J. Byrne is impaled with acupuncture needles and his head crushed by a fallen Buddha statue in a Chinese massage parlour; Jacqueline MacInnes Wood has a medical laser burn into her eyeball, causing her to fall out a window to her death where the eyeball rolls out to be squished by a passing car. The other Final Destination films served up the despatches with desultory flourish but all of these are staged with a great deal of gory enthusiasm on Steven Quale’s part and prove highly entertaining – most of the audience cheered and/or erupted into laughter as each transpired. Even the scenes with P.J. Byrne in the massage parlour and the subtitled Chinese masseuse (Jasmin Dring) introduce a sense of humour that is something wholly new to the series. Not to mention that the twist ending that ties up continuity with the first film is a surprisingly clever and original left field surprise. 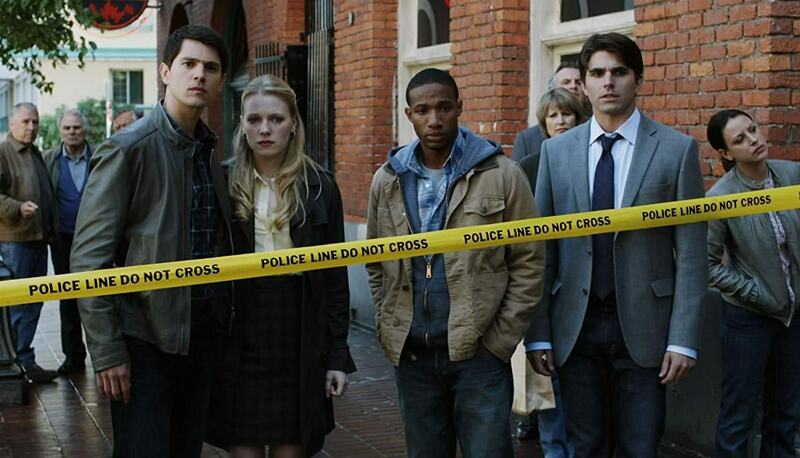 It comes with enough enthusiasm, creativity and originality to make Final Destination 5 stand out as the best of the series so far. Steven Quale subsequently went onto direct the disaster film Into the Storm (2014) and the action film Renegades (2017). The screenplay was one of the early works from Eric Heisserer who also wrote the remakes of A Nightmare on Elm Street (2010) and The Thing (2011), Lights Out (2016), Denis Villeneuve’s Arrival (2016) and Bird Box (2018).